Physicists and astronomers study the material world and the energy that drives it, from the smallest particles like neutrinos and Higgs bosons to the very largest structures in the universe, and ultimately the universe itself. In between these two extremes lies the world of atoms, whose properties control the behaviour of all the materials we encounter in our world, from computers and communications devices to our own bodies. Why Study Physics & Astronomy? There are two main reasons, often overlapping, to study physics and astronomy: to satisfy our curiosity about the material universe, and to look for solutions to humanity’s problems. Whether you wonder about why you and the rest of the universe are composed of elementary particles, or whether you worry about how we are going to provide energy for nine billion people without ruining our environment, getting a physics or astronomy degree will help you with your quest. We provide a great variety of learning experiences. Our subject has a large overlap with mathematics, chemistry, biology and engineering and can be approached from each of these angles. You can learn physics or astronomy because you wish to explore the beauty of mathematics and its relation to the structure of the universe, or if you want to push the boundaries of genetics or engineering. You can do this in class, in a teaching laboratory, and in a research laboratory as part of a coop placement or thesis project. You may like to learn theories of dark energy or protein folding, or you may wish to work at a lab bench with a wrench and an oscilloscope, or maybe with a telescope up a Chilean mountain. We have programs to satisfy all curiosities. Also read the "American Physical Society - Why Study Physics"
Students in Physics & Astronomy are highly encouraged to take on the coop option. Many students’ coop terms develop into long-term working relationships with employers. The department’s annual career night provides opportunities for students to interact directly with alumni and to hear alumni sharing their own career experience. The department offers a variety of degree programs, including Physics, Astronomy, Biophysics, and several combined majors and honours degrees. Interested in teaching? The department offers a BSc/BEd Dual Degree in Physics & Education, allowing students to earn a BSc and a BEd in five years. Enjoy designing and building? Consider the Engineering Physics Program, a fully accredited engineering program under the Faculty of Applied Science and administered by the Department of Physics & Astronomy. Furthermore, after graduation, more than one third of our students further their studies when they are accepted into graduate programs in Canada and around the world. Students in the department are all extremely passionate about physics and astronomy. But that doesn’t mean it is all work and no play. In fact, students in the department are well-rounded. The student societies and clubs within Physics & Astronomy – PhysSoc, Fizz, BPSS (Biophys), and Astronomy Club - provide many opportunities for students to be involved. These opportunities include sport teams, annual wine and cheese (which includes grad students and faculty), and various seminar series. The student societies and clubs also work closely with the department in developing events such as the career nights. During Imagine Day orientations, the department welcomes back new, returning, and transfer students through the Welcome Info Sessions, giving students a chance to get to know advisors, mingle with other students, and be familar with the department. The department organizes an annual departmental concert, and all members of the department - students, faculty, staff - are invited to perform. 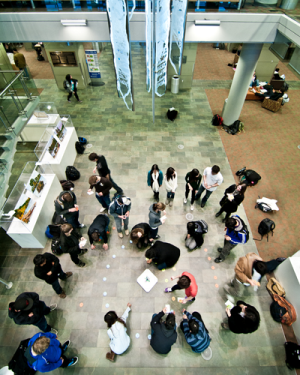 Undergrad students enthusiastic about developing physics challenges or demonstrations volunteer for events and competitions such as the annual UBC Physics Olympics, and the Outreach Program Faraday Shows. Or, if they enjoy taking up some challenges themselves, they can participate in competitions such as the CAP University Prize Exam. Engineering Physics holds an annual Information session for senior high school students. Ask your Science teacher for more information or email the program: enph@phas.ubc.ca. First year students in the Faculties of Science and Applied Science are invited to attend the Engineering Physics Open House held each winter. Details are sent via SISC email or contact the program: enph@phas.ubc.ca.